The week of November 17th, discussion sections for Professor Derek Counts’ ARTHIST 101: Ancient to Medieval Art and Architecture course were given the unique opportunity to closely examine facsimiles of medieval manuscripts. Anna Kupiecki and Kelsey McCarey Soya (teaching assistants for ARTHIST 101) brought students to the UWM Special Collections located on the fourth floor in the UWM Libraries. 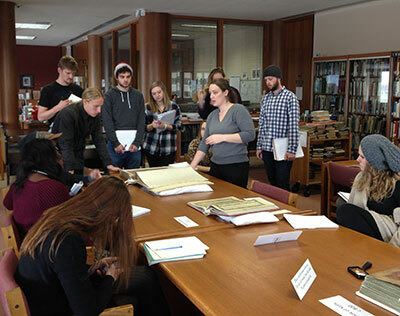 Special Collections Lead Library Services Assistant Lee Wagner and Graduate Student Assistant Hayley Jackson presented on the texts and their historical context, answered student questions, and gave students the opportunity to page through the texts to experience them more fully.